The Aquae trademark was first created and deposited in Paris in 2011. We focused on creating stunning jewelry designs, creating the perfect packaging. At the end of 2013, it became clear that there was a need for high-quality and beautiful jewelry at a more affordable price point and we established our new workshop in the heart of Dubai. At this point, most of our product was being shipped to jewelry stores. It was around this time that we realized that by strictly selling via the internet and avoiding any brick and mortar we could truly provide our valued customers with the best prices possible. Since then, we have gone strictly to online sales. Making it possible to ship all over the world while keeping costs extremely low. Cutting out the middleman, such as distributors, retail shops and staff, allows us to provide our customers with prices of our 18k gold and diamonds jewelry two or three times cheaper than in traditional shops. At Aquae Jewels, we want to make stunning pieces available for women to buy for themselves. Much like shoes, clothing and handbags are available for a wide range of prices, we want to make fine jewelry, designed with real diamonds and precious stones available as well. Pure gold and diamonds for every woman, for every moment in life. Aquae was founded by a jewelry and art amateur, passionate about beauty in its simplicity. She made designs of pure 18k gold and diamonds jewelry pieces that are simple and elegant. The name of Aquae comes from the ancient latin for water. Aquae designs are pure like drops of water. Today, our team has grown a lot with our success. Our founder is still making new designs every week herself and supervises the quality of production in the workshop everyday. 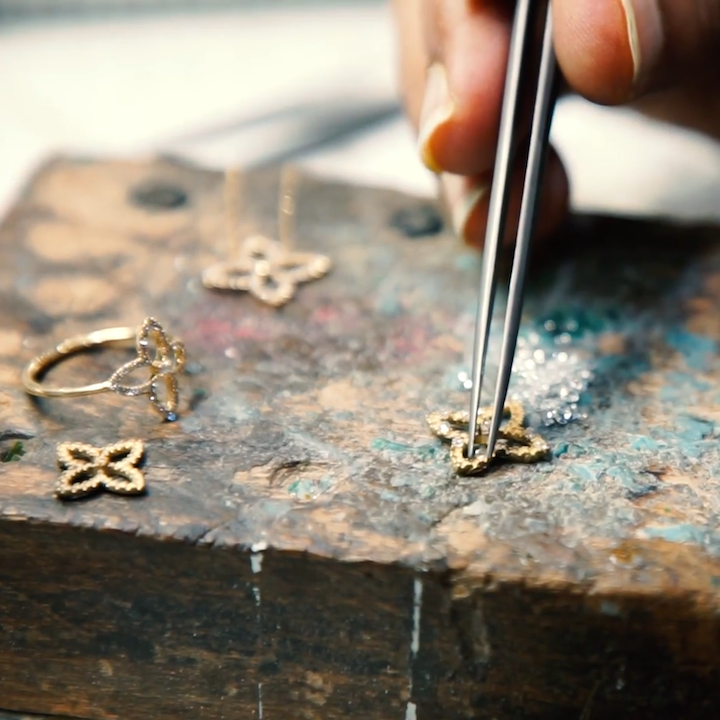 Our jewelry is handmade in our workshops in Dubai, then shipped by express courier. We deliver in most locations worldwide in less than 5 working days. And our customer services team handles queries from all channels convenient to our customers – website chat, WhatsApp, Facebook messenger and Instagram DM. The brand Aquae Jewels® is owned and operated by Aigue Marine DMCC.